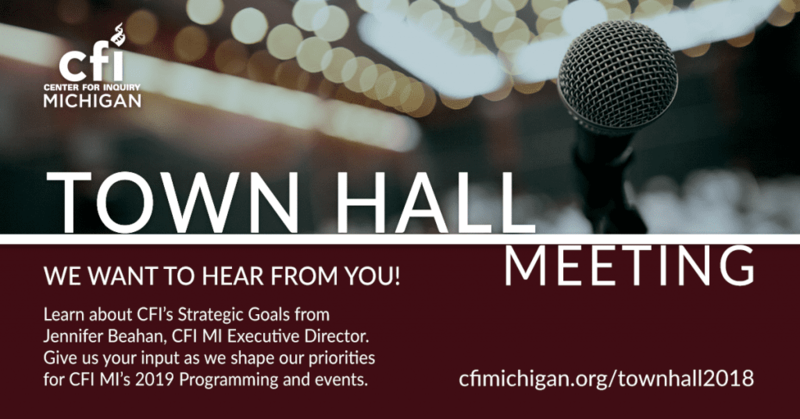 Join us for a special Town Hall style meeting at Skeptics in the Pub in Sterling Heights to learn about CFI’s Strategic Goals with Jennifer Beahan, CFI Michigan’s Executive Director. After a brief overview these goals, and a snapshot of the current “State of the Center,” Jennifer will facilitate a discussion with attendees to get feedback about event and programming ideas, and to listen to your suggestions, concerns, and questions regarding CFI’s mission and programming. Skeptics in the Pub (Sterling Heights) is in need of a new event host to continue meeting – please contact us if you are interested.